New Delhi, April 2 (IANS) To boost border security, the Congress on Tuesday promised to increase the strength of border guarding forces, construct integrated border outposts and accelerate the construction of roads along India-China and India-Myanmar borders. 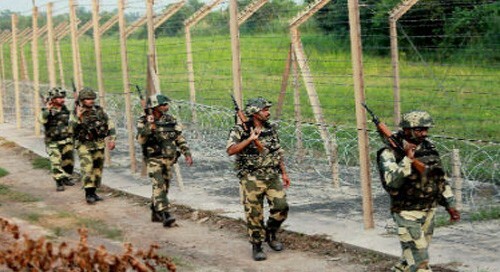 The strength of border guarding forces -- the Border Security Force (BSF), the Sashastra Seema Bal (SSB), the Indo-Tibetan Border Police (ITBP) and the Assam Rifles -- will be increased and they will be posted on or close to the border to prevent infiltration, illegal immigration and smuggling, said the Congress manifesto for the Lok Sabha elections released on Tuesday. The Congress also said it will construct modern and well-equipped integrated border outposts to provide good working and living conditions for the forces and that the distance between two border outposts will be reduced. Giving relief to the forces, it promised that the period of their posting in high altitude border outposts will be reduced to three months at a time. Noting that India's borders must be secure, Congress promised to accelerate the construction of border roads along all borders of India, especially, the India-China border. "We will enhance the capacity of the border roads organisation and create separate divisions to build roads along the India-China and the India-Myanmar borders," it said. In further relief, the Congress said at any given time, an adequate number of battalions will be on rest, recuperation and training and will not be deployed on operational duties. A Committee will set up to draft new Service Rules for paramilitary personnel, it said. Congress also promised to ensure increased representation of women to achieve a minimum of 33 per cent in the force strength of the Central Industrial Security Force (CISF), the Central Reserve Police Force (CRPF) and the BSF. "Every effort will be made to induct more women into the other border guarding forces, namely, ITBP, SSB and Assam Rifles." "We will enhance the facilities of health, education and housing for the personnel of the CAPFs and their families to bring them on par with the facilities provided for the Armed Forces. We will set up schools on the model of Sainik schools to enhance educational opportunities for their children," said the manifesto. The Congress also promised to enhance the status of the paramilitary personnel and benefits to their families if they die in action.